Filmed aboard an actual Royal Navy corvette, The Cruel Sea (1953) tells the story of the sailors aboard the HMS Compass Rose: the bonds that form between them, the daily pressures they face and their epic struggle to overcome the enemy. 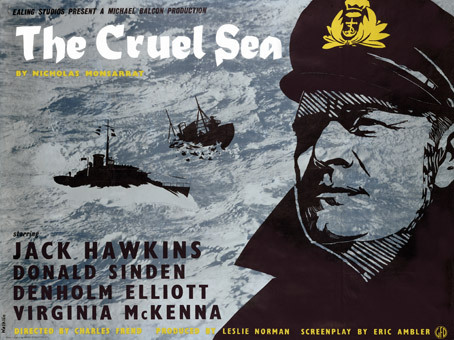 Nominated for a BAFTA for Best British Film, The Cruel Sea stars Jack Hawkins, Sir Donald Sinden and Stanley Clarke, Denholm Elliott, Stanley Baker and Virginia McKenna and is a gripping insight into the lives of unsung heroes at sea during the war, and the agonizing decisions and incredible peril they faced on a daily basis. The Cruel Sea will be released on UK Blu-ray with a digitally restored transfer by Optimum Releasing on 13th June 2011 at the RRP of £19.99.